Chelsea looked far stronger than Aston Villa from the outset playing with an upbeat tempo through the centre and with wingers tearing into full-backs with gusto. The Blues have been in the far east for two weeks and will naturally have become more accustomed to the steamy heat by now so, while Villa laboured, they thrived. 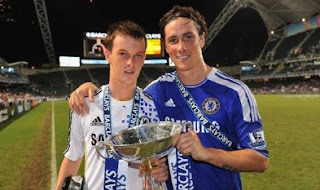 Chelsea got off to a flying start and took the lead after just 36 seconds as Josh McEachran underlined his determination to make a big impression this season. Nicolas Anelka, looking really sharp, broke down the right and his low shot forced a brilliant save from Shay Given and the Villa keeper made an even better stop from Daniel Sturridge's follow-up. But McEachran was on hand to force the ball into the roof of the net and put Chelsea firmly in charge against Villa who were left chasing shadows. This was a first senior goal to cap off a tour in which the 18-year-old has increasingly felt like a key member of the senior set-up. John Mikel Obi even got in on the act when he put the ball in the net following a Chelsea free-kick, but the Nigerian was correctly ruled offside. Chelsea were in complete control. Alex arrived at half-time, the defender seemingly over his knee injury, in place of Ivanovic who looked to have picked up a thigh problem. Yuri Zhirkov, starting at left-back, Nicolas Anelka and John Terry might have converted, while Given produced another staggering save to keep out Frank Lampard's header as the hour approached. Villas-Boas' reaction was to fling on Didier Drogba and Fernando Torres and there was to be no respite for their flustered opponents. Within a minute of coming on, Torres finally got himself on the score sheet in Asia in what will be a massive relief to Villas-Boas to see the Spaniard remove a weight from his shoulders. Florent Malouda's low shot went straight into Torres' path and the striker just steered it past Given to leave the Villa keeper with no chances. Patrick van Aanholt then fizzed a drive just beyond Given's far post and the Irishman denied Torres with his legs after the striker had breezed past Richard Dunne. Chelsea would have won far more easily had it not been for Shay Given's heroics. Chelsea bid farewell to the far east with victory; the Barclays Asia Trophy, a striker looking more like his old self and four clean sheets. The final preseason fixture is against Rangers in a week's time. Chelsea Cech; Bosingwa, Ivanovic (Alex HT), Terry (c) (Chalobah 89), Zhirkov (Van Aanholt 57); McEachran (Drogba 57), Mikel, Lampard (Kalou 84); Sturridge (Drogba 57), Anelka (Benayoun 73), Malouda.